Vancouver Pen Club: Pacific N.W. Regional Pen Round-Up! a smashing success!! Pacific N.W. Regional Pen Round-Up! a smashing success!! The first annual Pacific N.W. Regional Pen Round-Up! (of which I wrote about in this blog post) was a great success, according to organizers & attendees... and the folks in charge are already working on preparations for next year's Round-Up! We had the event Saturday July 13th at the Lucky Labrador Brewing Co., in N.W. Portland. I would like to thank all those who attended, including the vendors! We had a very good cooperative effort for our 1st attempt at the Pen Round-Up! We had some pretty good local advertising and I saw a lot of faces that I did not recognize. We had a good turnout for the event. There were people who attended from British Columbia, Washington state and of course from around Oregon. There were vendor/collectors from B.C., California, Washington, Wisconsin and Iowa and several of us from Oregon. Everyone seemed to be enjoying themselves. I enjoyed talking with everyone who wanted to chat and look at pens. I think I bought about six pens and did trades for a couple of others. There are three that will go into my own collection. I also bought nine pens and a mechanical pencil the day before, at the big local antique show. 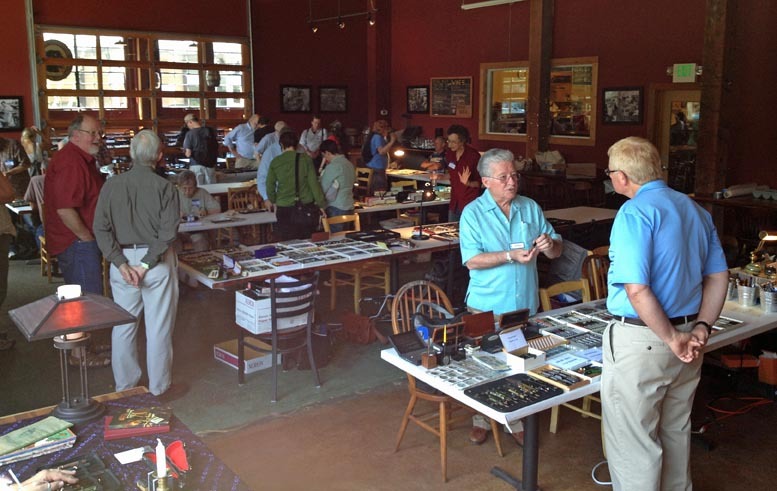 Here are a couple of comments from people who attended Pen Round-Up: "I thought the event went very smoothly. It was friendly, relaxed, casual, and I have the feeling that people who came were satisfied. I really liked the fact that there was no admission charge, and only a very modest table charge too." And, about the location, "... it was truly perfect for this event. Location, food, parking, the room itself, access to the freeways, etc." ~~~~~~~~~~~~~~~~~~~~~~~~~~~~~~~~~~~~~~~~~~~~~~~~~~~~~~~~~~~~~~~~~~~~~~~ Many thanks to all who organized the show (esp. Stuart Hawkinson and Michael McNeil), to Mike Rosen for the photos, and to Ingrid for her blog post. I'm already looking forward to the 2014 Round-Up!